Meet your new, high-performance workout partner—she's always up for a challenge and ready to help you reach, exceed, and create new goals while delivering a superb feeling of comfort and control as you work up a sweat. To do so, we started with a high-quality FACT 9r carbon fiber construction that's lightweight and extremely responsive, not only making the Sirrus a better climber, but also making it easier to carry up the stairs after your commute. Then there's the crisp and precise shifting that comes at the hands of a microSHIFT & Shimano mix of components, powerful hydraulic disc brakes, and all the comfort that follows our scientifically tested and engineered Women's Body Geometry components. So as you push yourself to reach your goals, you'll feel more connected to your bike than ever, leaving you feeling that you have the perfect partner on your path to health and wellbeing. Meet your new, high-performance workout partner shes always up for a challenge and ready to help you reach, exceed, and create new goals while delivering a superb feeling of comfort and control as you work up a sweat. To do so, we started with a high-quality FACT 9r carbon fiber construction thats lightweight and extremely responsive, not only making the Sirrus a better climber, but also making it easier to carry up the stairs after your commute. Then theres the crisp and precise shifting that comes at the hands of a microSHIFT & Shimano mix of components, powerful hydraulic disc brakes, and all the comfort that follows our scientifically tested and engineered Womens Body Geometry components. So as you push yourself to reach your goals, youll feel more connected to your bike than ever, leaving you feeling that you have the perfect partner on your path to health and wellbeing. > The FACT 9r carbon fibre frame is engineered and designed with our Fitness Geometry, helping you ride more efficiently in a position that will see you riding comfortably, mile-after-mile. And the all-new Future Shock suspension system at the cockpit delivers a revolutionary degree of comfort and control. > The lightweight FACT carbon fibre fork provides a smooth, responsive ride, while the fender mounts give you the option to install rain-fighting fenders. > Braking duties are handled by TRP Flow Set Control hydraulic disc brakes to ensure effective, consistent, and reliable power through any kind of terrain or condition. 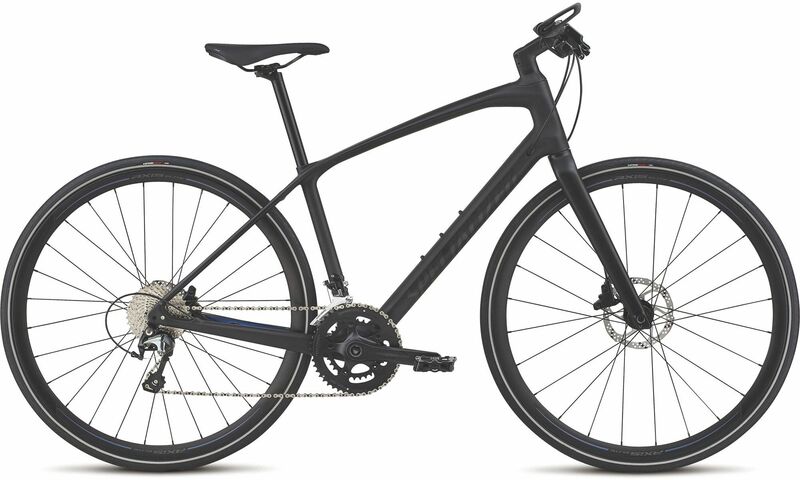 Please see below for delivery options for Specialized Sirrus Elite Carbon City Womens Sports Hybrid Bike 2019.